Sweeping scenic flight to and from Kathmandu -Lukla with amazing views of Himalayan peaks. Land of Highlanders the Sherpa of Everest with impressive Buddhist culture and age old traditions. Within scenic Sagarmatha National Park listed as World Heritage Sites and its high beautiful surrounding From green alpine forest of rhododendron, pines trees to arctic zone of moraine, ice and glaciers. Exceptional views from high Kalapathar hill top with closest views of Everest and adjoining giant peaks. Walking at the foot of world highest Mt. Everest at base camp within Khumbu Ice falls and glaciers. Everest base camp meditation & spiritual Trekking, hike to EBC with retreats adventure(optional cost extra). Everest Base Camp Trekking provides an opportunity to all travelers and adventurer fulfilling their dreams to stand and admire world number one peaks, standing at the foot of Mt. Everest tallest mountain on earth with sweeping panorama of other giant snow capped peaks. Everest Base Camp Trekking, made more famous and popular conquest to its summit in May 29th 1953 by legendry late mountaineers Tenzing and Hillary, since then mass flow of trekkers, adventurer and mountaineers have poured in this awesome area high and scenic Khumbu valley in the shade of Mt. Everest. Besides mountain views the local culture and traditional life of the highlanders the Sherpa people is equally interesting, visit its high and charming traditional villages around Phakding-Monjo-Khumjung and Pangboche including Namche Bazaar, the capital of Khumbu where colorful Saturday market takes place and walking into magnificent Thyangboche Monastery. Starting this fabulous adventure to Everest Base Camp taking an early morning flight to land at Lukla on its unique airstrip, and then following the Dudh Kosi River right up to its source at base camp where walks leads through nice and lovely Sherpa farm villages encountering interesting prayer wheels and carved stone walls. Walk leads into lovely cool alpine woodland filled with tall rhododendron-oaks-magnolia-pines and fir tree lines, as walk progress entering into wild and windswept country where vegetation and tree lines disappears for short juniper and rhododendron bushes, with daily views of Everest with majestic Amadablam and other peaks. With rest and acclimatization days before heading towards much higher terrain, our journey finally reaches at our main highlight destination at the base of Mt. Everest of above 5,364 m / 17,070 ft high overlooking notorious and awesome Khumbu Ice falls and glaciers. Adventure concludes with a climb on top scenic Kalapathar at 5,545 m and 18,298 ft high rewards you with amazing panorama of mountains with Mt. Everest at mere distance and then heading back to Lukla for exciting short flight to the hustle and bustle city life of Kathmandu with overwhelming time and memories on Everest Base Camp Trekking. Itinerary of Everest base camp trekking on a cheap budget lowest cost, best service. Day 01: Reach Kathmandu, complete Nepal visa process, & meet guide, transfer to Hotel. Day 03: Morning Flight to Lukla 2,840 meter and hike to Phakding 2,670 meter – 5 hrs. Day 04: Trekking Manjo- jorsalle to Namche – Bazaar 3,460 m – 07 hrs. Day 05: Acclimatization or Rest day at Namche Bazaar, optional short excursion. Day 06: Hike Phungi thanga to Thyangboche 3,880 m – 7 hrs. Day 07: Trekking Pangboche to Dingboche 4,250 m – 06hrs. Day 08: At Dingboche with rest day for another acclimatization, optional short hikes. Day 09: Trekking Thukla to Lobuche 4,940 meter – 06 hrs. Day 10: Trek to Everest Base Camp 5,370 meter,then return to Gorakshep 5,180 m – 06 hrs. Day 11: Hike to Kalapathar 5,545 m trekking back to Pheriche 4,260 meter – 07 hrs. Day 12: Trek to Kyanjuma 3,665 m near Sanasa – 06 hrs walks. Day 13: Hike down Namche then to Monjo 2,880 m – 7 hrs. Day 14: Trek to Lukla airport – 5 hours. Day 15: Fly back to Kathmandu airport … optional tours available. Day 16: Kathmandu optional tour or relax because it is contingency day. Day 17: International airport drop, final departure . EBC cost & best time of the year with guide & porter from Lukla or Kathmandu. Book with local company and adventure with Sherpas in Himalayas. Hike to Everest, meditation & spiritual Trekking in 10-14 days. Welcome to Kathmandu, Nepal -meet our guide, drive to Hotel. On setting foot in Nepal at Kathmandu International airport, where you will be received by our guides & office staffs with warm welcome of garland & then take to your respective hotels in the hub of Kathmandu valley, after checking in to your rooms getting refreshed our guide or staff will brief with information regarding your trip to Everest base camp with other useful information. Evening Nepalese dinner in one of the best and authentic Nepalese restaurant includes local folk dance cultural program as part of an entertainment. Kathmandu tour or Patan or Bhaktapur and treking stuffs preparation. With busy day in Kathmandu with options joining in our interesting tour which leads you around Kathmandu beautiful historical sites, as Kathmandu city with Patan and Bhaktapur steeped with religious monuments of temples-monasteries and stupas listed most as UNESCO Heritage Sites. After a pleasant and exciting guided tour return back to your hotel with rest of the afternoon free, preparation for Everest Base Camp trekking next early morning. As per the short flight time, morning transfer to Kathmandu domestic air terminal for super scenic panoramic Himalayas flight to airport of Lukla with awesome view of mighty Himalayan chain of mountains with Mt. Everest and then landing at Lukla unique airstrip. In Lukla with final preparations where much of the gears will be carried by porters or on pack animals (Ghopkyo crossbreed of Yaks and normal domestic cattle). Walk leads downhill with short uphill and on gradual winding path most of the way to Phakding village for first overnight stop. Phakding a nice and large spread out village by the glacial River Dudh Kosi with views of Kwangde Himal located in this river gorge. Morning walk leads to much higher as the trail follows the beautiful river, crossing few bridges to reach at Monjo village and into Sagarmatha National Park. 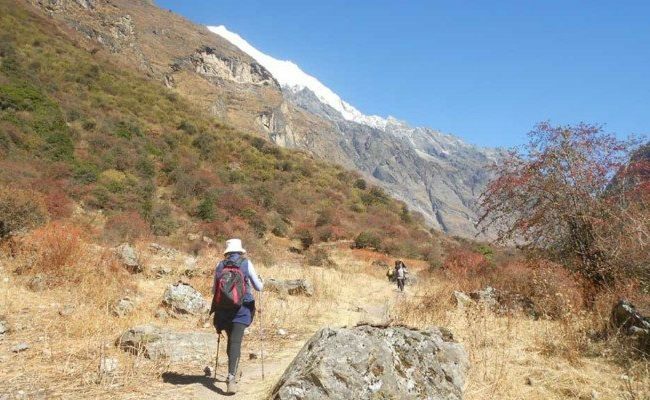 Walk on gradual path by the bank of the river and in afternoon time climbing up reach at famous Namche Bazaar with views of Everest-Nuptse and Lhotse on walks. At Namche transfer into a nice and cozy lodge with fabulous views of Tharmasarku and Kwangde Himal with time to wander around Namche. Acclimatization day , Rest or optional walk around Namche Bazaar - or short excursion to near by villages. Free and rest day in Namche for better acclimatization before climbing higher terrain, on this day take a short hike to Namche view point with its interesting museum full of information of Sherpa people culture-mountaineering with flora and fauna of the region. The top of Namche offers grand views of Mt. Everest-Lhotse-Nuptse with magnificent Amadablam peaks towards north. Other options hike up to Everest view hotel beyond Syangboche at an altitude of 3,880 m high with sweeping panorama of Everest and adjoining peaks. Morning starts with short up and then on scenic pleasant path with few ups and downhill overlooking views of Everest and Amadablam, as the walk leads into patch of alpine woodland and then dropping towards Imjatse River at Phunki-Tenga a small settlement. Here with lunch break, afternoon uphill into a nice forest of rhododendron-oaks-magnolia-pines and fir trees, then finally reaching at our overnight stop at Thyangboche near its famous old Buddhist monastery. A charming spot surrounded by snow capped peaks with close views of Amadablam-Everest and other peaks, located within green forest. We visit the famous monastery where you can observe the monks and priests in prayer halls, here most of the climbers and mountaineers take blessing from the priest for safe and successful climb on Everest and other high peaks. Walk is pleasant today but makes a difference walking much higher altitude, starting with a descend for 55 minutes to the bridge, from here tree lines fades for shorter junipers & alpine rhododendron with mixed bushes known as azalea showing big change in high altitude. Trail continues to another beautiful sherpa settlemnet, Pangboche, it is the biggest last permanent settlement in this region. After this other villages like Pheriche, Thukla, Dingboche are active only in the spring to autumn to serve the travelers. The path climbs to Somare and crosses the Imja stream with the beautiful view of Nupse, Lhotshe and Amdablum mountains. Finally trail leads to another beautiful Sherpa village Dingboche, enjoy the prayers wheels and stones and yak farms. Acclimatization day in Dingboche, optional hiking to near by peaks. It is mandatory to spend another night in this altitude. Choose any hiking like towards amadablam or Island peak or Lobuche. If ou climb to Nagarjung peak can see Makalu on a clear day. After breakfast, start climbing towards Thukla, enjoy the prayers wall and mane wheels along the trails. You may see yaks grazing and some mountain goats enjoying the the sun bathing. Do not forget to look back and take pictures of Mount Amadablam. Take short rest at Thukla hill top for drinks or even lunch and continue to Lobuche for overnight stop. You are at the dreamland, zig zag trails takes you to the actual base camp of Everest, depending on your walking speed it may take 5-7 hours round trip. This adventure trip will be life time experience. The famous Ice-falls of Khumbu is very long, follow the proper tails with your guide and experienced staffs only. After a marvelous and exciting time with adventure of a lifetime experience retrace the journey back to Gorakshep for overnight stop. Trek to Kyanjuma 3,665 m near Sanasa - 06 hrs walks. Walk leads to a fine start with views towards a river after the bridge a slow hike to Thyangboche Monastery. Trek back to Kyanjuma for overnight halt, a sleepy and quiet spot with few fine lodge and view of Mount Everest and Amadablam. A short and easy day after losing much altitude, retrace the journey back to Lukla with last final climb from Choplung village to reach the famous gate named after 'Pasang Lamu' a first Sherpa lady who climbed and died on Mt. Everest. Finally our adventurous walks completes in Lukla with time for rest and to celebrate the success on Everest base camp trekking and last night sleep in Lukla and around Mount Everest area. Flight back to Kathmandu and drive to the hotel. According to the flight time for Kathmandu transfer to Tenzing & Hillary air terminal at Lukla airport, a short scenic in small aircraft bring you back in Kathmandu, and then transfer to your hotel with afternoon free for shopping spree and rest. We have allowed extra day in Kathmandu as contingency day in case of flight cancelled from Lukla, which might occur sometimes due to unforeseen bad weather conditions, if all goes well as per our itinerary days enjoy this free day with individual activities or join in for another interesting city tour. As per your international flight for home bound or to other respective destination, transfer to Kathmandu airport with excellent memory and overwhelming adventure of a lifetime on Everest base camp trekking. UNESCO heritage Sightseeing (if mentioned and added in the itinerary) or as optional. Applicable Trekking Information Management Systems TIMS & National Park Permit Fees. Experienced sherpa, guide and porters with equipment, daily wages-medical insurance, meals and transportation allowance. Cultural Nepalese dinner in Kathmandu. Comprehensive medical tools and re-confirmation of international air flights. Domestic airfare as per the itinerary Kathmandu Lukla Kathmandu. Visa for Nepal- Round airfare to Nepal-personal travel and International Travel medical insurance. Personal Expenses and Lunch - dinners in Kathmandu, gratitude (tips) hard / soft drinks during trekking/tours. Mountain hiking gears and personal medical kits. Emergency rescue evacuation by any means of transportations including Helicopters services and personal medical kit. If Early return from the trip due to personal reason or medical related problems- in this case clients must bear his /her own expenditure on return from trek and in city including expenses of accompanying guides and staffs. Trekking Equipment List to Bring from home or rent and purchase in Kathmandu: Perfect fitting, light &amp; comfortable shoes are recommended over training boots and clothing will be necessary, for strong hot sun on drive along the lower altitude to freezing high altitude temperatures during the night in the himalayan region. Half pant, thin trouser, half/full shirt, T-shirts, cap or hat, are suggested while walking, also skirts and long sleeved shirts are comfortable. COTTON TROUSER for all season. SUNGLASSES / GOGGLES: VERY IMPORTANT TO AVOID UV . VERY LIGHT THERMAREST: USEFUL WHILE YOU FEEL HARDER MATTRESS IN THE LODGES. CAMERA GEARS WALKING STICKS / POLES: Useful crossing rivers and in snow and ice areas. All your bigger bags with much weight will be carried by our porters and pack animals like Yaks and Mules, on domestic airlines 20 kg is the maximum weight that you can carry not counting your hand bags. While on trek you will be carrying your personal belonging in your day pack which will be at least 5 to 10 kgs maximum while other bigger bags carried by our porters. Weight differs on the areas of trekking destination, on climbing you will be carrying much with climbing equipment and warmer high altitude gears as well. Normally 25 to 30 kgs are enough on moderate and adventurous trekking programs which is the standard weight carried by porters.